It's hard to beat STAR WESTERN. This issue's cover has another appearance of the familiar cowboy/girl/geezer trio, although the girl's not a redhead this time around. And inside are stories by Harry F. Olmsted, T.T. 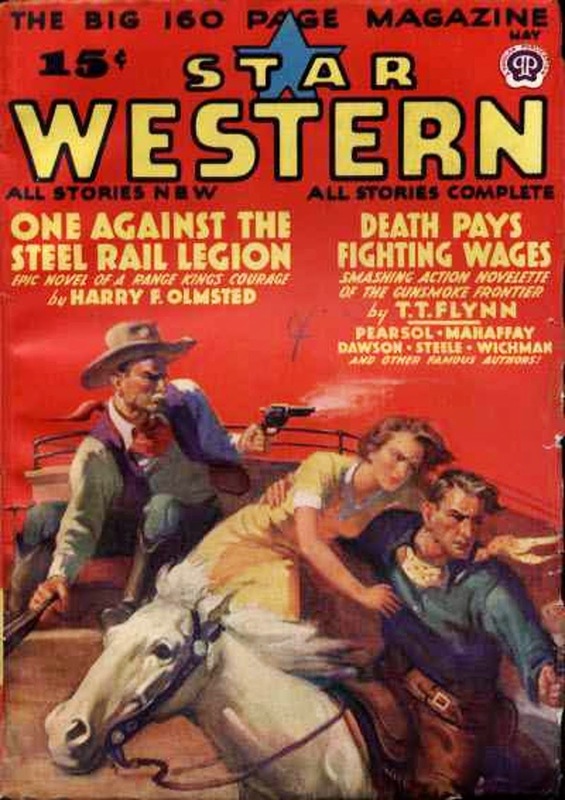 Flynn, Peter Dawson, and Gunnison Steele, four of my favorite Western pulp authors, plus yarns by Robert E. Mahaffey, John G. Pearsol, and Glenn Wichman, prolific and well-regarded pulpsters. Some mighty fine reading in there, I'll bet. I like the title of the short "Death Pays Fighting Wages". Stories in Popular Publications pulps always had great titles.